The world-renowned [Attack on Titan] makes its debut in the English Edition of Weiss Schwarz!! 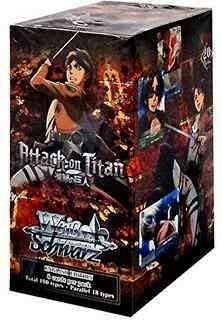 Stand up against the Titan onslaught with Weiss Schwarz [Attack on Titan] English Edition Booster Pack!! 1 PR card out of 8 types will be included in each display as a supplement!! Exclusive SP Gold Foil/Hot Stamp signed cards from the Japanese voice actors/actress are inserted randomly in packs! !